PS3 Slim for $300 in K-Mart, Sears Ads? 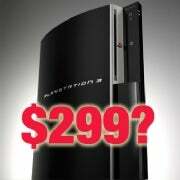 Sony will announce a cut in price for the PlayStation 3 console today. The Japanese electronics giant has called press conference in Cologne, Germany, when it is expected to slash $100 of the PlayStation 3 retail price. Sales in the video-game industry have been going down for most of 2009, and Sony's PlayStation 3 remains the most expensive next-gen gaming console, priced at around $400. The expected price cut will rejuvenate hardware sales and further reductions would put pressure on Microsoft and Nintendo to lower prices as well. Some speculate that Sony won't be actually cut the price of the PlayStation 3, but rather launch a cheaper "slim" model at a new lower price of $299. The probability of new PS3 model is low, though, as many retailers already have a big stock of the current-generation console. Retail giant K-Mart has already published today advanced advertising, confirming the expected PS3 price cut. The above ad (click to enlarge it) reads, "The rumors are reality: New low price & a new exciting PlayStation 3." It is yet unclear what the "new exciting PlayStation 3" is exactly, but it could represent a hard drive and firmware upgrade to the current system. Sony has sold the smallest amount of Playstation 3 consoles this year in comparison to its competitors, the Microsoft Xbox 360 (ranking second) and Nintendo Wii (in the top spot). Sony's announcement is scheduled at 12.30 p.m. Eastern Time. Follow Daniel on Twitter @danielionescu.